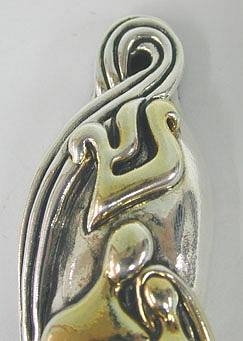 A romantic artisan sterling silver parcel gilt bride and groom mezuzah case. The case has a romantic scrolling and curling pattern all through it. At the center of the mezuzah stand hand in hand 24k gold plated figures of a bride and a groom. Above the two figures hovers the Hebrew letter Shin in the same curling pattern, which stands for Shadai (Almighty) and Shomer Daltot Israel (The guardian of the Israeli doors) - one of God´s names. The mezuzah was made in the electroforming method. Measurements: Length: 4.8in. / 12.2cm. Width: 1.1in. / 2.8cm. Will take parchment up to: 3.4in. / 8.63cm. Weight: 23.1gr. / 0.74oz. Marks: 925 for sterling silver.